Careful cooking can prevent the overcooking of hard-boiled eggs. Cooking hard-boiled eggs is one of the most basic and easiest kitchen tasks. Most people believe they can't overcook hard-boiled eggs -- that they are basically foolproof. But that is not true. It's easy to overcook hard-boiled eggs. With hard-boiled eggs, timing is everything. Place eggs into a pan and cover them with cold water. Make sure the water totally covers the eggs with one inch of water on the top. Bring the water to a boil. Then turn the heat down and continue to cook for 10 minutes. 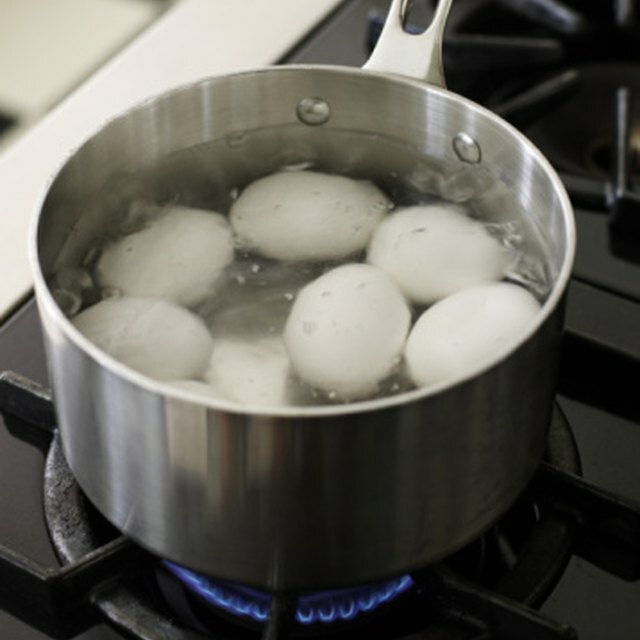 Remove the pot of eggs from the heat after 10 minutes, otherwise, they will boil too long and overcook very quickly. Cool them once they are boiled. GoodEgg.com suggests running cold water over the eggs or placing them directly in ice water to quickly chill them. They should remain in the water until they are totally cool. Take a close look at your eggs when you finally remove them from the pot after cooking them. According to FoodaQ, you will immediately notice that hard-boiled eggs are overcooked. The outside of the yolk will change from its natural yellow color to a shade of either green, blue or grey -- which depends on how long the eggs are overcooked. The texture of the eggs also becomes rubbery. GoodEgg.com notes that improper chilling of boiled eggs can make part of the yolk turn green. Overcooked eggs are safe to eat, but their appearance is just not optimal. FoodaQ: Overcooked? Hard Boiled Eggs?